maybe I've been too liberal with the translations. I'll be more literal from now on. How do you feel taking down Nestea to advance to ro4? I last got into ro4 on the 20th of July last year and it’s a similar time this year so it felt like I could advance once more. I am feeling fantastic. Were you aware that Metropolis, the map used in Set 1, did not have a neutral supply depot at the bottom of the ramp? I was. I played against Coca on Metropolis last week and found out then. I checked in VODs of other players and made sure before preparing this strategy. Your TvZ hasn’t been great since your return. Honestly though, I’m very confident in the match up. For some reason, I get really nervous in official matches and lose. Even today, I was worried that nerves would get to me but looking at TiG’s winner predictions, I saw that one of the reporters predicted my victory. That article gave me the confidence I needed. My win rate in practice was excellent. I played 5 games each against practice partners and I usually went 4:1 or 5:0. So I knew that as long as I took the first set, I would go 3:0. You are the final Terran in this season. You face Seed in ro4. I beat him in ro32 already so I will play with confidence. As long as I take Set 1, I should go 3:0. That strategy wasn’t planned. However, my opponent picked Whirldwind which was totally unexpected so I improvised on the spot but it turned out rather well. It was a defeat but I think it can be a great strategy with some refinement nonetheless. Are you confident about reaching the finals? Just like how I made it into ro4 similar to last year, I fear I may be eliminated in ro4 once again. However, my return to top form is complete so I will aim for the finals. I will play without caring about the pressure. I think I can do well that way. I want to thank Coca who helped with practice as well as BboongBboon, Salmosa and Aria. There were more people who helped with practice but I forgot to bring the list of names with me today. I want to say that I am grateful regardless. Annyeong, who I am very close to, is retiring so I wish him the best of luck. You took down Naniwa after a close match to advance to ro4. How do you feel? I watched Naniwa’s games and he seemed deficient in his PvZ so I wasn’t worried. However, since last evening, I started getting a bad feeling so did some extra practice which saved me today. Many expected a one sided victory for you but it was actually quite close. My opponent didn’t play as I expected. He played in a style I’ve never encountered before. Additionally, I made numerous mistakes which made it closer than it should have been. Luckily, I adapted as the games went on so I was able to win in the end. After beating back the 4 gate, I felt like I could win no matter what. So I made mass roaches and attacked but Naniwa had more units than expected. I did think for a moment I was going to lose but with the gas I had banked up and with mistakes from Naniwa, I was able to take the game. You face MC in ro4. MC is a Protoss who I acknowledge to be the best at PvZ. I’ve beaten him plenty of times in foreign tournaments but at the recent MLG qualifier, I suffered a humiliating defeat. 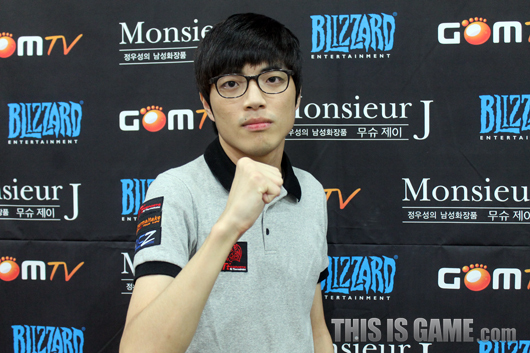 That’s why I wanted to face him once more and it’s great that we get to meet in ro4 of GSL. As much as MC is a Protoss I respect, I won’t drop my guard. You must want this season more than ever as the finals is held in your home town. I think I will regret it forever if I don’t make it to the finals. This finals is very meaning to myself but also to my team. That’s why we’re going to go to both GSL and GSTL finals. It’s a great source of motivation. We had a few foreign sponsors but this is the first time a major Korean corporation has started sponsoring us. This sponsorship has motivated myself and all my teammates. Who do you think you will face in the finals if you make it? I think TvZ would be the most fun. So I hope I get to face Byun. I want to thank our sponsors Lotte, Razer and our partner MYM. I want to thank my practice partners Finale and Vampire and also the coach who today brought with him the chair I use at the training house. Before the match, my family did a big cheer for me and last but not least, I want to thank my fans and my girlfriend. been refreshing to see this, and voila, there it is. You are one reliable guy sw! Best terran on prime He is so smart. He is brimming with confidence, and with good reason! I hope he keeps it up, TvZ finals would not be to bad. Seems like Byun has really figured out TvZ if he goes 4-1, 5-0 in practice a lot. Hope he keeps his confidence though! Byun fighting! Terran's last hope this season. DRG rebutted that he isn't cocky! Oh god I swear if that starts to become normal/figured out and I start playing vs raven/BC late game ima hate zvt :p.
Surprised to see Byun 3-0 going to have to watch those games. Also surprised to see DRG 3-2 naniwa but sounds like he had game 4 won but decided to lose by going hydras which is a good thing to do when you want to lose . Seriously what do you people want? Him praising Naniwa in the whole interview nonstop? He said Naniwa did something he never seen before and it was harder then he expected. so whats the consensus on TvZ now? Lol too true. Or when naniwa says something disrespectful...omg he doesn't really mean it, he's just passionate. from the very start, losing to the 2 rax he scouted very early, nestea played some pretty awful games. im very glad theres a terran in the semifinals, but nestea certainly didnt look like a tiptop zerg in those 3 games. Lol, when Naniwa says something that's actually true everybody wants to kill him, just look at the thread for his ro8 interview. That basically means "He played gimmicky, else he wouldn't have stood a chance"
Not saying I like/dislike anything, just trying to keep it real for you. Great interviews, thanks once more. I swear people find always a way to make everything sound bad. Honestly what do you people want from him? praise Naniwa in every single sentence? I agree, people make everything sound worse then it is. Naniwa did something that DRG hasn't seen before. He threw him off but DRG caught on...Adapted to his play. Naniwa did amazing taking it to the last game 3-2. Just when I thought I was out, Blizz pulled me back in.. This fanboy's heart is crushed. Oh damn MVP is sponsored by Lotte now, thats a big pickup. Good for them! He said Naniwa played different, not better, than expected. Doesn't mean its better though. It just means he wasn't prepared. "I think we’re over it. In late game, battlecruisers supported by ravens can beat Zerg. The solution has been found." KNEW IT! "From now on, unless it’s a special situation, I will never use hydras." Day - "That stupid ice cream truck representing happiness!" Didn't I write that I didn't think DongRaeGu hates NaNi? Context: Naniwa one of the best players here, but with PvZ supposedly his worst matchup versus DRG, maybe the best player right now. He had good and surprising strats. He had a good execution but made more mistakes than the best of the best. 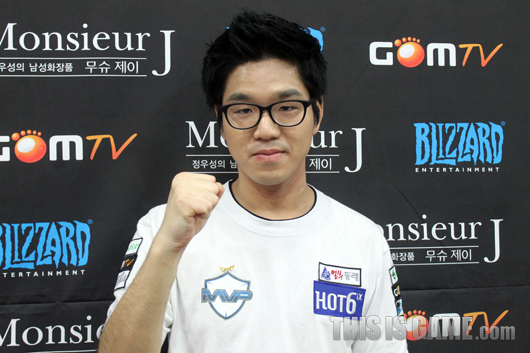 DRG did not play his best during the series, especially in game 4. The serie was very close for these reasons.